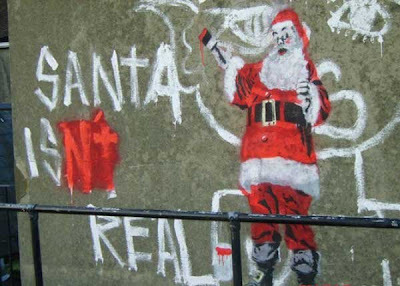 A graffiti artist has taken on a mean-spirited vandal who daubed walls with claims Father Christmas doesn’t exist by painting a jolly Santa over the top. 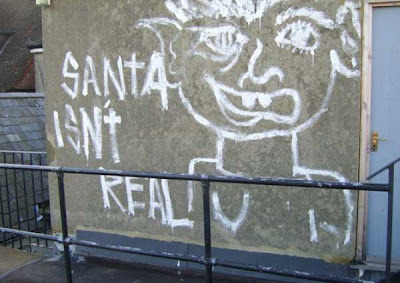 The grinch had scrawled the words ‘Santa isn’t real’ on a wall in the middle of Whitstable, Kent, making parents of young children furious. But a local graffiti artist known only as Catman went out in the dead of night to play his part in keeping the Christmas magic alive for youngsters in the town. At some point last weekend, Santa made an appearance on the wall - paintbrush in hand - to dispel the myth he doesn’t exist. The Christmas cartoon has been welcomed by local councillors, who are usually harsh critics of all graffiti.